I am so excited about today's post! This year, I participated in the Great Food Blogger Cookie Swap. Yes, it is as fun as it sounds! You sign up, receive the addresses of three other food bloggers, and send each of them one dozen homemade cookies. In return, you receive three different boxes of delicious cookies from other bloggers. The event partners with Cookies for Kids' Cancers, so everyone makes cookies for a great cause! Opening each package of cookies was such a treat! Each of the bloggers wrapped the cookies up so special that it felt like a Christmas package. My friends and I enjoyed sampling all the cookies while watching the live version of the Sound of Music on a frigid Denver night! 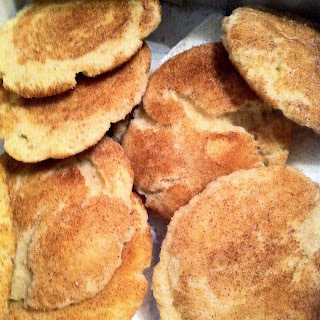 I received a box of snickerdoodles from Christine at the Mixing Bowl Gal! Christine is also a Colorado blogger, too. These snickerdoodles were like a piece of "cinnamon toast" in cookie form! Ever wondered how the snickerdoodle acquired such a silly name? I did some searching on it, and some food historians think that the snicker doodles are actually German cookies. In German, Schneckennudeln means snail noodles, which is actually a type of pastry with cinnamon swirls. After trying to pronounce Schneckennudeln I could see how snickerdoodle could be a mispronunciation. Some say it came from a New England tradition of giving cookies silly names, and I also read that there was a super hero named Snickerdoodle. Snickerdoodles may have a goofy name, but these cookies are a classic, and the cinnamon sweetness is perfect during Christmas time. Thank you for such delicious cookies, Christine! My next box was full of cranberry of cranberry bliss cookies from Kimberly at Rhubarb and Honey. It was bliss to receive this box! This past year was the first time I tried a cranberry bliss bar from Starbucks (where have I been?? 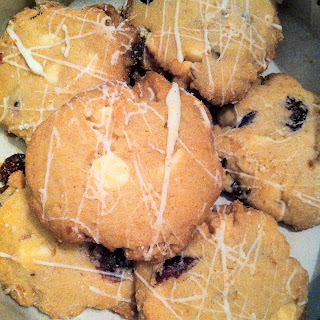 ), and since then, I've been loving the cranberry white chocolate combination. These cookies have all of the goodness of a cranberry bliss bar baked into a cookie: tart cranberries, creamy white chocolate, and buttery sweet cookie. It is a perfect cookie to enjoy with an afternoon cup of tea! Thank you for sharing baked bliss, Kimberly! Thank you very much to Lindsay of Love & Olive Oil and Julie of the Little Kitchen for organizing the Great Food Blogger Cookie Swap! I can't wait to participate again next year. Now, what cookies did I make? After much deliberation, I decided to make pfeffernussen. Pfeffernussen are a type of German spice cookie. They are mildly sweet and full of an array of what I call the "holiday spices"--cloves, cinnamon, allspice, and nutmeg. Pfeffernussen have pepper in them, which gives them a bit of a kick! Pepper is not a spice that you typically use when making cookies, but the pepper is not overpowering by any means. Because the cookies have molasses, they are soft and chewy. 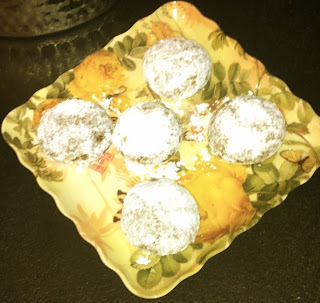 Since these are covered in powdered sugar, they remind me of a snowball! They are simple to make, and you may already have these ingredients in your pantry! Preheat oven to 350ºF. Line two baking sheets with parchment paper or silicone baking mats. Set aside. In a medium mixing bowl, combine the flour, spices, and baking soda, and set aside. In a stand mixer or large mixing bowl, beat the butter, molasses, and brown sugar on medium speed until light and fluffy. Add the egg and vanilla and beat until combined. Then, add the dry ingredients and beat until combined. Roll the dough into 1 1/4 inch balls and place on the baking sheets, leaving about 1 1/2 inches between the balls. Bake until the cookies are golden and firm to the touch; they will have slight cracking on the top when they are done. Transfer the cookies to a cooling rack, and allow to cool for 10 minutes. Working in batches, transfer the cookies to a paper bag full of confectioners' sugar. Shake the cookies lightly until covered with the confectioners' sugar. What a fun way to celebrate the season. Love your recipe. Now that really says Christmas to me! I hope you have a great Christmas and New Year. I'm so glad you enjoyed the Cardamom Cookies! Your Pfeffernussen sound delicious. I've never used pepper in my baking, but I think it's time I gave it a try. Spices like cardamom and pepper sure make great cookies! I loved the Pfeffernussen you sent me! They taste like Christmas!! Thanks! Thank you so much for the cookies - we really enjoyed them. Some of my favorite flavors. I'm so happy you enjoyed them! I got my first package from the Aussie Secret Santa today. Only 2 more to go. I never thought of making pfeffernussen! Love these. What a great idea for a cookie swap - I'll have to try it next year. Pfeffernussen - Snickerdoodles - what great names! 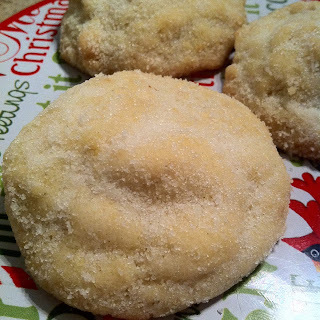 This has been on my list of cookies to make for a while - love that you did this for the holidays!